Arterial sclerosis , unlike atherosclerosis , is any morbid loss of arterial elasticity. 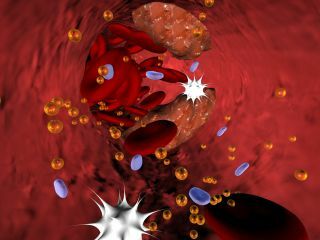 Quantitatively the most abundant cholesterol in atheromas, but white blood cells (macrophages) play a key role in atherosclerosis. their inability to deal with the atheroma. In contrast, & quot; arteriosclerosis & quot; is any malady or loss of arterial elasticity. Arteriosclerosis is often associated with hypertension , butit can not be confusedwith atherosclerosis . The term "coronary artery" can be denoted both. Large arteriosclerosis of the arteries is measured in a non-invasive manner and is used as a general indicator of cardiovascular health ( Wilkinson2009aag ). The description of mechanisms of action of adaptogens, especially ginseng on the arteries, which are equally applied in the prevention and treatment of arteriosclerosis, is described in more detail in the description of its effects on the prevention and treatment of heart disease , the protective action against atherosclerosis , its antihypertensive action and its protective and regenerative effects on the blood vessels .